BeenThere-DoneThat: More information about Colchester, Essex. The Tourist Information Centre is on the corner of High Street and Queen Street. 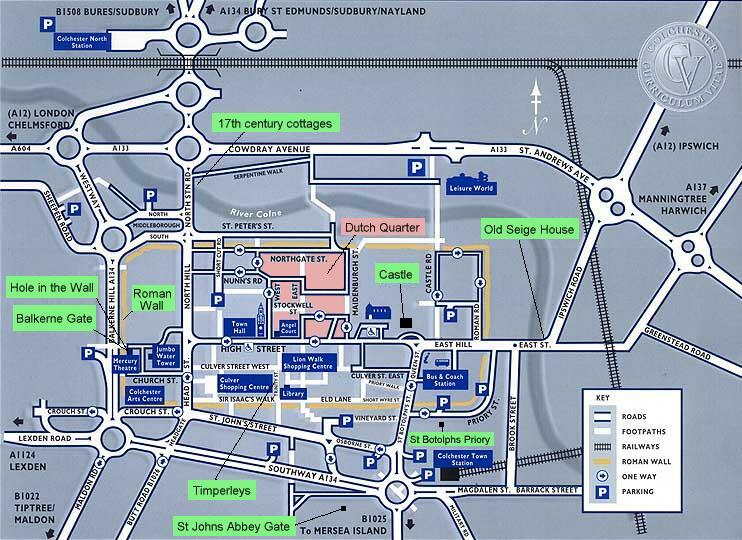 Town centre showing locations of interest. The width of the image covers just over 1.5 miles. Clicking on a green block will take you to the appropriate photograph. You can download a PDF version (295k) of this plan for printing. You will need Adobe Acrobat to view or print the document. You can also download it as a Zip file. Plan by kind permission of Colchester Borough Council. Note that although the route of the Roman wall is shown as complete on the plan above there are sections missing and you will be able to see only some sections. One of the best sections is the one on Balkerne Hill starting from the Balkerne Gate. Another easily seen section is part way down Castle park alongside one of the paths although only about half the height of the wall is showing with a considerable portion of this section now under the ground. Further sections can be seen in other parts of the town.